The Falkland Islands, also known as Isla Malvinas, is a wild territory so to speak. It is where people go to admire nature in its raw state and watch wild animals so the place is ideal if you just want to get away for a while. The population on the islands is low and the fact that you can find yourself in a place with nobody around can give you a very calming feeling. However, for a successful trip, you need to do some research on the location. Below you will find a short guide and a few things that you should know about the Falkland Islands before you get there. First of all, some of you may need a visa to get to the Falkland Islands. Not all nationalities are visa exempt, which is why we recommend that you check out the visa policy of the Falkland Islands. 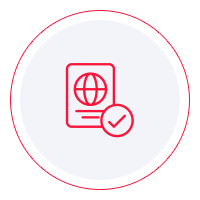 You can use the Visa Checker on iVisa, and it will tell you whether or not you need a visa. The requirements are not out of the ordinary. You need a valid passport, a return flight ticket, and proof of accommodation. The hotel reservation confirmation should suffice. While it is not mandatory, it is recommended that you get travel insurance as well. Not that anything should happen, but in case it does, you will be airlifted from the islands, and as you can imagine, the bill for that would be significant. It is better to be prepared. As to how you can get to the Falkland Islands, you have multiple options, depending on where you are from. You can take a flight from the UK, or you can take one from Chile, whichever is more convenient. If you want to take your time and you have the patience, you can go to the Falkland Islands via cruise ship. It is a beautiful experience, and if you have the time, you should try it. The best time to visit the Falkland Islands is in the summer. Except that their summer is in December, February, and January. The islands are located in the Southern hemisphere, after all. However, be prepared to find tourists during that time. Shoulder season may be more suitable if you want the location to be emptier. Plus, some fascinating things happen during the year. For example, in September, the seal pups make an appearance on the beaches, and this is also the time when you can spot orcas offshore. November is yet another excellent time to visit the Falkland Islands because that is when baby penguins start to appear. The food in the Falkland Islands is fantastic. You would not expect to find such exquisite menus from cuisines all around the world but you will be pleasantly surprised. Fine dining is possible in the Falkland Islands and you should not avoid some of the local delicacies. While internet access is possible on most islands, you need to purchase a card from the hotel you are staying at. Most hotels provide Wi-Fi, but Weddell Island, for example, has no internet access at all. If you are lucky, you can find a lodge and ask for permission to use the internet, but you should limit yourself. As for what you need to take with you when you visit the Falkland Islands, your luggage should not contain many things, just a few essentials. For one thing, you need a pair of some really good walking shoes. You will be walking for most of your trip, provided that you want to explore the islands. Waterproof footwear is also a good idea to keep your feet warm. Some warm clothes are also necessary because it can get really chilly at times, especially if you visit during the winter seasons. Last but not least, do not forget to pack a high-quality camera and camera gear. The landscapes are unforgettable, but you want to capture them in HD for posterity. The bottom line is that you cannot get bored in the Falkland Islands. You have plenty of activities to keep you busy. You can walk, hike, observe the wildlife, and so on. As long as you are prepared for the trip, you are going to have a lovely time there.